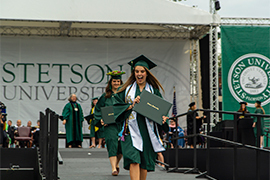 Stetson undergraduate and graduate students have until Monday, Feb. 11, to apply to graduate this May. 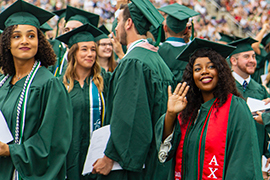 Students can find everything they need to know about the fast-approaching deadline, as well as other key information on the Commencement 2019 website. Find the Commencement Schedule of Events, links to order your cap and gown, and announcements to send to family and friends, and accessibility accommodation information. The Graduate Commencement Ceremony will be Thursday, May 9, 2019, at 5 p.m. in the Edmunds Center. An ROTC Commissioning Ceremony will occur Friday, May 10, 2019, at 10 a.m. in Lee Chapel inside Elizabeth Hall. The Undergraduate Awards and Recognition Ceremony will take place on Friday, May 10, 2019, at 3 p.m. in Lee Chapel. The Undergraduate Commencement Ceremony will take place Saturday, May 11, 2019, at 8 a.m. in Spec Martin Memorial Stadium. Bookmark the Commencement 2019 website today, share it with family and friends, and get ready to celebrate your graduation.